I'm sure there's a lot of jokes I could make about stereotypical tensions between nerds and jocks, but there's science to be had at the World Cup, and I'm never one to back down from an exercise in applied physics. If you've been watching any of the matches on TV or have any friends that are, you may have heard about the controversy centered around a popular fan item - the vuvuzela. 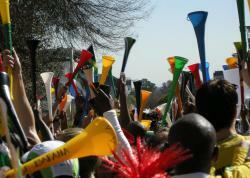 Vuvuzelas are plastic trumpets used by soccer fans in South Africa to cheer on their team and goad the opponents. When blown, they can achieve decibel levels upwards of close to 130 dB. That's as loud as a loud rock concert or a jet at take off. It's gotten to the point that referees and coaches want the horns banned, and fans at home are complaining that the noise is drowning out network commentary. Now for the science. Editors at the German blog Surfpoeten have pointed out that because the horn has a simple acoustic fingerprint (tones at 233, 466, 932, and 1864 Hz), very basic filtering software can remove the vuvuzeula drone from broadcast media (original German link). This may not prevent the players on the field from having to endure the noise, but it could at least help out the estimated 125 million people watching at home (per match). This same idea may be in use in technology you own. Noise cancelling headphones have been around for a while. They sample ambient audio around you and play an opposing wave to cancel it out. Much like with the vuvuzelas, monotone sounds such as lawnmowers and airplane engines are the easiest to block. Courtesy Science Friday It's Friday, so it's time for another Science Friday video... The honk of a horn or the rumble of a truck sounds like noise to most of us. But to Lucy Fitz Gibbon, and others with absolute pitch, there are notes embedded in that noise. Psychiatry professor David Ross, of the Yale School of Medicine, explains what's known about how people acquire this mysterious ability. For an interesting presentation of science, checkout the Symphony of Science. The Symphony of Science is a musical project headed by John Boswell designed to deliver scientific knowledge and philosophy in musical form. Self-portrait by Matthias Buchinger: The forward-most curls on Buchinger's left shoulder near his collar are magnified on the right to show the inscribed hidden biblical text.Courtesy Public domain via WikipediaI recently (and literally) stumbled upon a web page about this remarkable man from the 17th century. His name was Matthias Buchinger, and despite being born without hands, legs or thighs, this guy managed to live a full and amazing life with no less than 4 wives (!? ), and fathering something like 11-14 children depending on the source. But even more incredible was how - despite his severe physical deformations - Buchinger was able to rise above Nature’s challenges and become an accomplished musician, inventor, artist, model-in-a-bottle builder, and magician. Born in Anspach, Germany in 1674, he was the youngest of nine children, and became widely known as “The Little Man from Nuremburg” performing his feats of wonder across much of Great Britain and Europe. Buchinger was only 29 inches tall, and for hands had "two excrescences which grew from his shoulder-blades, like fingers without nails" but his skills in magic, marksmanship, and music were legendary. He played several musical instruments, some of which he invented himself, was accomplished at skittles (bowling), and could dance a hornpipe as well as anyone. He was also a talented calligrapher. His engraving skills are evident by the self-portrait to the right. Hidden within his curls are seven psalms and the Lord’s Prayer written in tiny letters. Buchinger lived much of his adult life in England and Ireland, and performed before King George and many of Europe’s royalty. He died in Cork, Ireland in 1732. I don’t know about you but I find Buchinger quite inspiring. You can read more about this human marvel in the links below. 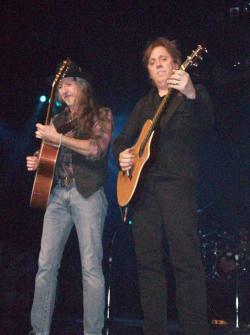 Like minded: Doobie Brothers guitarists Pat Simmons (left) and John McFee get their fingers and minds in synch as they perform a guitar duet called "Five Corners. "Courtesy ThorHave you ever heard a really great guitar duet? The players sound as one even though their doing their own separate thing. But now science has shown that the process of duetting puts instrumentalists in a like mind. Click here to get the full report and to see brain wave EEG scans done of duetting guitarists. 1. 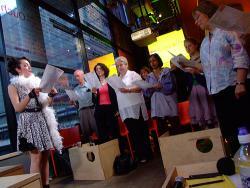 The research found that brain waves of duet players were already starting to synch up before they started playing. Once the music started, those brain waves really matched up tight. 2. Other sections of their brains not having to do with music were also synching up. 3. The success of a duet might have a lot to do with how well the players can get their brains to work the same way. 4. I finally found a way to work a photo of my beloved Doobie Brothers into a Science Buzz post. Have you had a musical (or any other performance) experience where you felt your mind was in synch with your fellow performers? Share your experience here with other Buzz readers. Sing a Song of Science! The British Society for the History of Science (apparently not as stuffy as it sounds) has just announced its annual competition to find the world's most imaginative and poetic songs about science. You can read all of the details about how to enter the competition here - and I really think you should, if only because studies show that making music is good for you! The basic idea with this contest is to take a familiar tune like 'Yankee Doodle Dandy' or 'Clementine' and rewrite the words, but more original efforts will be welcomed, if not by the BSHS, than by Science Buzz readers! Feel free to post your ideas and inspirations here for a critique! The contest organizers are also encouraging people to submit videos of themselves and their friends performing their songs in a creative manner similar to the Dance Your PhD Thesis contest that happened in Vienna last year. Who knew? To get you all started on your award winning compositions, I suggest listening to these 1950's tunes sung by Tom Glazer and Dottie Evens, then do the Constellation Jig! No, it’s not the lament of some landlord who’s rented out the upper level apartment to a rock-and-roll loving tenant. It’s a case being heard by the U.S. Supreme Court right now pitting whales off the coast of California against the U.S. Navy. 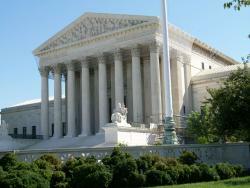 Justices heard oral arguments yesterday on the case. Environmentalists are challenging the Navy’s claim to perform training exercises along the California coast which use extensive and strong sonar transmissions. The sound waves of those sonar blasts can harm whales and other marine mammals, petitioners contend, with sounds that can be up to 2,000 times louder than a jet engine. Some scientists feel that sounds that loud can cause whales to lose hearing loss, bleed on the brain and possibly lead to mass strandings on beaches. Decision spot: The U.S. Supreme Court is the site of a pending decision pitting U.S. Navy sonar training exercises against the health of marine mammals like whales.Courtesy Thor CarlsonThe Navy says that strong sonar level is critical to be able to detect submarines that can elude weaker modes of sonar. Based on justices’ questions and reactions, however, it appears that court is leaning toward siding with the Navy and national security concerns. Here’s a full report on yesterday’s court session. Justices were pretty upfront in stating their lack of expertise in mammal biology and national defense matters. So if you had to decide on this conflict, where would you come down on this question? Does the health and a comfort of whales trump national security? Is loud sonar just an unfortunate byproduct of keeping our national interests safe? Share your thoughts here with other Buzz readers.